a chess program by Johan de Koning written in C, which had its debut at the 7th Dutch Computer Chess Championship 1987 and was further developed, participating at computer chess tournaments until the present, in total winning four Dutch Computer Chess Championships and one International CSVN Tournament, the DOCCC 1991, DOCCC 1993, DOCCC 1995, DOCCC 1998, and the ICT 2003. The King, famous for "his" interesting and entertaining playing style, was commercially market by TASC as ChessMachine, in bundle with Gideon, running on an ARM2 RISC CPU. ChessMachine The King was shared winner of the 4th Computer Olympiad 1992 and had good results at the WMCCC 1990 and WMCCC 1991, further ported for various dedicated chess computers, most notably TASC R30, TASC R40, Saitek RISC 2500 and Mephisto Montreux, and was also incorporated as analysis engine of TascBase. 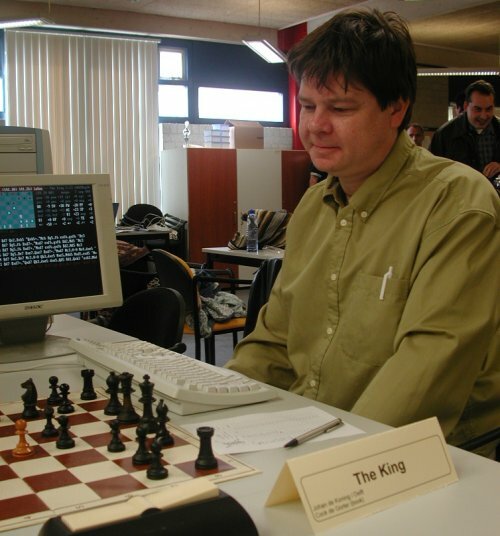 However, Johan de Koning's greatest commercial success was entering the PC and Windows mass market, when in 1994 The King became the chess engine of Chessmaster 4000  , which remains the best-selling chess franchise in history   . Written by Johan de Koning, already known for his program which has competed for several years in Dutch tournaments. This latest version runs on the ARM2 RISC CPU and represents 2.5 man-years of development. The evaluation function is complex and hence a little slow. Positional scores can "easily exceed several Pawns". Separate evaluation terms are used for opening/middle/endgame with smooth transitions between them by using 3 weights which sum to 100%, giving a fuzzy definition of the phases. The search techniques include check extensions and chess-specific static rules for additional extensions. Singular extensions are not used, but lower bounds are computed to limit the search in the selective phase. Best moves from earlier iterations, history heuristic, killer heuristic, priority to captures, and a refutation table are all used to order moves, which are generated in the all-and-sort fashion. Specialized endgame knowledge is included and this is actively being expanded. This page was last edited on 12 February 2019, at 20:31.